Publication: May 12th 2013 by Topaz Publishing. 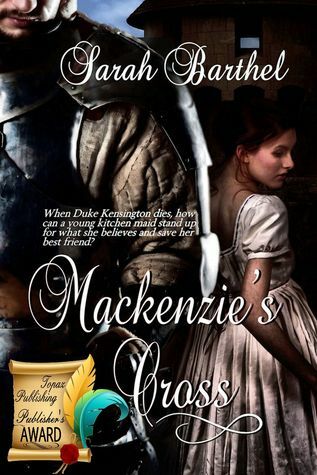 Mackenzie’s life has always been one of duty. However, in a land where even the Brotherhood of the Knights are becoming power hungry mongers, how can a young kitchen maid maintain her morals when tempted with all she’s never had? In the end, the truth is even more complicated than Mackenzie had ever imagined. If it had been anyone else's voice, Mackenzie wouldn't have rushed, but Melissa was not one to draw attention to herself. Upon entering the room, Mackenzie rushed directly to the small crowd which had gathered around Melissa and the corner carving table. Pushing her way to the center of the commotion, she stopped beside Melissa. She was so focused that she didn't hear the whisperings around her. When she finally reached Melissa, Mackenzie exclaimed, "My goodness, Melissa. What's wrong?" Instead of speaking, Melissa pointed above the carving table. Mackenzie glanced up, and lost her breath for a moment. The carver's knives were hanging in a row. The largest knife was in its proper place, but blood dripped down the silver blade and created a puddle on the table. Such omens could destroy happy festivities. "What does it mean?” One of the pages whispered. "To be sure, death and destruction is upon us," another replied. Mackenzie glanced around the kitchen for Adilla, but could not make out her form. Someone had to squash the panic forming in the crowd; unfortunately, that person had to be her. Mimicking Adilla, she clapped her hands and looked over the crowd. "We have far too much to accomplish to worry over childhood stories. In the excitement of the day, much has been forgotten. I'm certain that's what happened here. Now, get back to work. I don't want Adilla to discover that many precious minutes were wasted over a dirty knife." As the crowd dispersed, Mackenzie caught Squire John staring at her from the doorway. Once people were doing as they should, she turned her attention back to Melissa. "I'm sure Laura simply forgot to wash this knife." Mackenzie tried to sooth her friend. "Laura would never forget." Melissa lowered her voice and leaned closer to Mackenzie. "She knows what such a vision means." "What does it mean?" Squire John's voice rang clear, making Melissa squeal again. Mackenzie waved her hand to the few who looked up, bidding them go back to work. Melissa's voice broke into a husky whisper. "When a bloody knife is found hanging, as this one, it means something disastrous is going to happen." Sarah Barthel was raised on a steady diet of old Hollywood musicals and classic literature. Nurturing her love of language, she learned French, Latin and Japanese. This led her to study in Paris and host a Japanese exchange student. She followed her passion to American University in Washington DC, where she studied British literature and history. Since then she has thrown herself into writing. She loves to find unique, and unexplored ideas in familiar settings. A member of the Society of Children's Writers and Illustrators, she currently lives in the Chicago suburbs with her husband, daughter and two crazy dogs. Thanks so much for helping spread the word on Sarah's debut, Kelly!